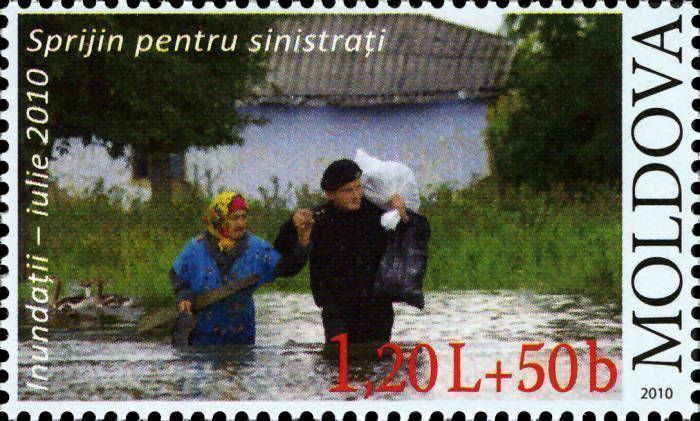 On 11 September 2010, the Post Office of Moldova (Poșta Moldovei) issued a postage stamp with the title Support for Flood Victims. The issue comprises one stamp, with an associated cancellation (postmark) and first day cover (FDC). The designer was Vitalie Leca. The printing was performed by Tipografia Centrală, Chişinău. The 2010 Romanian floods were the result of an extreme weather event that struck Romania in late June 2010. Currently, at least 21 people died. The north-east of the country, especially Suceava County was most affected. Also affected was the Chernivtsi Oblast in neighbouring Ukraine. Read more.. This article uses material from the Wikipedia article '2010_Romanian_floods', which is released under the Creative Commons Attribution-Share-Alike License 3.0.